Portraits of Prime Minister Vladimir Putin are surging in online sales after his re-election to the Kremlin, almost eliminating demand for President Dmitry Medvedev's image. "People were buying Medvedev before, but now they're buying Putin, and no one is buying Medvedev," Vladimir Tishko, director of the Vramke.ru online store, said in a telephone interview. Vramke, which lists the lower house of parliament and St. Petersburg City Hall as clients, sells pictures for 900 rubles to 17,600 rubles ($31 to $604). Putin, 59, is set to start his third term as Russian president in May. The leader, who held the top office for two terms ending 2008, has said his protege Medvedev, 46, will replace him as head of the Cabinet. Igor Yurgens, a presidential adviser, said last month that Medvedev should reject the post. While the retailers declined to provide exact sales figures, data from Yandex, which operates Russia's largest search engine, show interest is rising. The number of queries per month for "Putin portrait" have surged from about 1,000 in August to almost 4,000 by late December, according to the latest figures available. "In the past half month, there have been a lot of Putin orders, much more than before," said Alisa Shumkina, who works at Vseportrety.ru, another Internet portrait retailer. "We've only sold one Medvedev." Alexei Abramov, an employee at Nastenku.ru, said his store was seeing the same trend. Most of the demand comes from state employees, the three portrait sellers said. Russia has about 1 million civil servants, according to data from the State Statistics Service. Still, portrait retailers say their boom days have passed. More than 12 years since Putin first assumed the presidency in 2000, demand for his image has mostly been met. 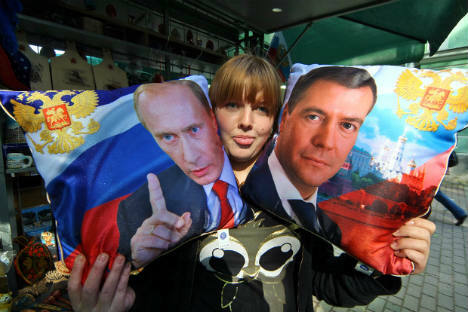 "Everyone already has a Putin," said Tishko, of Vramke.ru. "Now if Prokhorov had won, that would have been great." Billionaire Mikhail Prokhorov, the only first-time candidate in the presidential campaign, finished third with 8 percent of the vote, lagging behind Communist leader Gennady Zyuganov, who took 17 percent. "We would have made a fortune overnight" with a Prokhorov victory, Shumkina said.